Now it says $24.99, so I guess they fixed that. DrumsAnywhere is the closest solution to real drumming. Aerodrums does not give you the real feel of playing drums. HitStix is merely a toy. You obviously have never seen Aerodrums. I am not that convinced that – aside from the “fun” side of the project – the two guys understand what playing drums is about …. a real drum gives different sounds not only depending on “how hard you hit it”, but also depending on WHERE you hit it (crashs/cymbals, snares, toms … they all give a variety of sounds). Well, ok, “fun” is good of course … but “drums” anywhere seems a bit far fetched for what you can do with that setup. how about putting gyros in and depending on angle of attack you have have different sounds. higher more angled “hit” on the accelerometers and you got a cymbal. Seeing this gave me a flashback to the 80s. 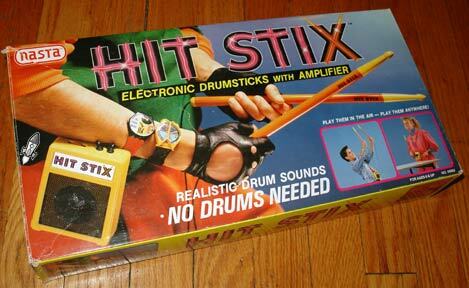 I remember a portable drum kit that does pretty much the same thing, only that it resembled drumsticks. The only upside to this project that I see is being able to swap out samples. So they’re re-creating a toy from the 90’s? My apologies. I had the page loaded at work and didn’t see someone beat me to posting the Hit Stix comment. Definitely a rehash of an old product, but I like the simple nature and extensibility. It has a lot more potential than these guys put in this revision. I can see additions for a foot pedal easily added. Either they learned their lesson or they took your advice – their DrumsAnywhere kit only requires a contact microphone now. I see nothing wrong with Drumanywhere copying or improving an old idea with some new features, especially cosidering the personal devices the SW could be run on not available in the 90’s. It appears these young innovators are listening to the feedback from real drummer / musicians, so I’m looking forward to their 2.0 and beyond. I operate a small home studio and my percussion needs are modest and simple and this uses only the amount of surface area I have to give it. Nicely done!